After graduating in 1997, Anya appeared on The Howard Stern Show as "Anya the Au Pair", a woman wanting to be the au pair for Stern's children. After that appearance, she was hired by Mike Halloran at radio station XHRM-FM in San Diego, California, then at Y107 in Los Angeles, Premium Radio in North San Diego County, California, and finally at KBZT FM 94/9 for six years. In San Diego Marina played her first open mic night and began to write her own songs. She developed a live show that included anecdotes and frank stories told between songs, and continued working as a DJ on the radio in San Diego while playing around town and, later, touring. Her recorded debut was a five-song EP called Exercises in Racketeering, which eventually led to a full-length album, Miss Halfway, which was released January 25, 2005. Anya subsequently opened for Jason Mraz, Juliana Hatfield and Rhett Miller among others. She was named one of the "Best Unsigned" acts by the San Diego CityBeat. Miss Halfway was produced by Scott Russo, the frontman for rockers Unwritten Law, and Peter King from The Surfers. The record eventually earned a San Diego Music Award for Best Recording. On January 20, 2009, Marina released her second album, Slow & Steady Seduction: Phase II. The album was produced by Brian Karscig from Louis XIV and Britt Daniel from Spoon. The music video for the album's first single, "Move You", was directed by Scott Coffey. On June 8, 2009, the video for "All The Same To Me", directed by Josh Forbes, premiered exclusively on it. 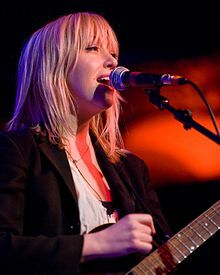 In the summer of 2009, Anya was nominated for 3 San Diego Music Awards: Artist of the Year, Album of the Year (Slow and Steady Seduction: Phase II), and Song of the Year ("Move You"). On September 10, 2009, "Move You" won the award for Song of the Year, beating out fellow nominees including Jack Tempchin and Jason Mraz. Her song "Satellite Heart" was featured on the Twilight Saga: New Moon soundtrack. "Satellite Heart" was released October 8, 2009, with the video (directed by Scott Coffey), released on November 3, 2009. Later that same month, she performed the song at multiple venues on the nationwide 'New Moon Talent Tour'. Marina co-hosted the live MySpace broadcast of the New Moon premiere. Anya was highlighted in an article by CNN.com as an artist poised on the edge of breakout success due to her involvement in the soundtrack. Marina's cover of "Whatever You Like", originally by rapper T.I., was featured on the November 9, 2009 episode of Gossip Girl, "They Shoot Humphreys, Don't They?" In 2009, Marina moved to Portland, Oregon to write and record the album "Felony Flats", named after a local neighborhood. It was released three years later. In 2012, Marina moved to New York City to write and record her next album. She co-hosts a humorous podcast about relationships with roommate and comedian Nikki Glaser and comedian Phil Hanley called We Know Nothing. The pretext of the podcast is to give advice, yet the three rarely take calls, instead becoming distracted with anecdotes from their own lives and current events. ^ "ChopShop | Home". Chopshoprecords.net. Archived from the original on July 26, 2011. Retrieved 2011-08-07. ^ Staff (2009-03-23). "Move You | Anya Marina". MTV. Retrieved 2011-08-07. ^ Anya Marina: "all the same to me", spinner.com. June 8, 2009; accessed November 9, 2014. ^ Official website for Anya Marina Archived November 8, 2009, at the Wayback Machine., anyamarina.com, November 5, 2009; accessed November 9, 2014. ^ "'New Moon' soundtrack to make new stars?". CNN. 2009-11-13. Retrieved 2011-08-07.